PracticeLink.com W INTER 2018 45 the Q uality of life issue editor of The White Coat Investor (whitecoatinvestor. com), a financial blog for physicians. "That forgiveness, unlike PS l F, is taxable — meaning you'll owe a tax bill that could be substantial," says Dahle. "For most docs with anything but a terrible debt-to-income ratio, the debt will have been paid off in less than 20 years anyway, so there won't be anything left to forgive." Shopping around: refinancing Interest rates on federal loans are not always the most competitive, so physicians often refinance to a private company to gain a more attractive rate. 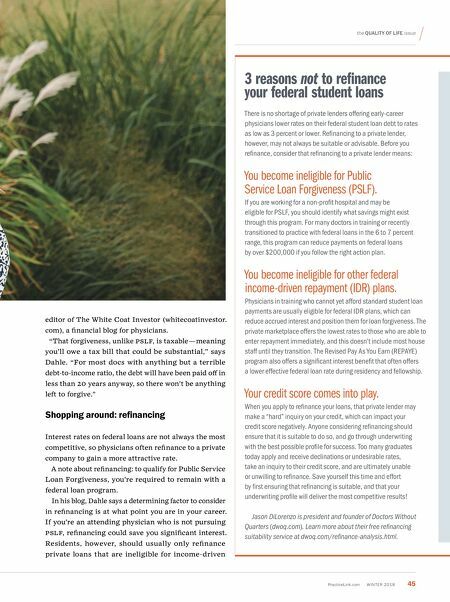 A note about refinancing: to qualify for Public Service Loan Forgiveness, you're required to remain with a federal loan program. In his blog, Dahle says a determining factor to consider in refinancing is at what point you are in your career. If you're an attending physician who is not pursuing PS l F, refinancing could save you significant interest. Residents, however, should usually only refinance private loans that are ineligible for income-driven 3 reasons not to refinance your federal student loans There is no shortage of private lenders offering early-career physicians lower rates on their federal student loan debt to rates as low as 3 percent or lower. Refinancing to a private lender, however, may not always be suitable or advisable. Before you refinance, consider that refinancing to a private lender means: You become ineligible for Public Service Loan Forgiveness (PSLF). If you are working for a non-profit hospital and may be eligible for PSL f , you should identify what savings might exist through this program. f or many doctors in training or recently transitioned to practice with federal loans in the 6 to 7 percent range, this program can reduce payments on federal loans by over $200,000 if you follow the right action plan. You become ineligible for other federal income-driven repayment (IDR) plans. Physicians in training who cannot yet afford standard student loan payments are usually eligible for federal IDR plans, which can reduce accrued interest and position them for loan forgiveness. The private marketplace offers the lowest rates to those who are able to enter repayment immediately, and this doesn't include most house staff until they transition. 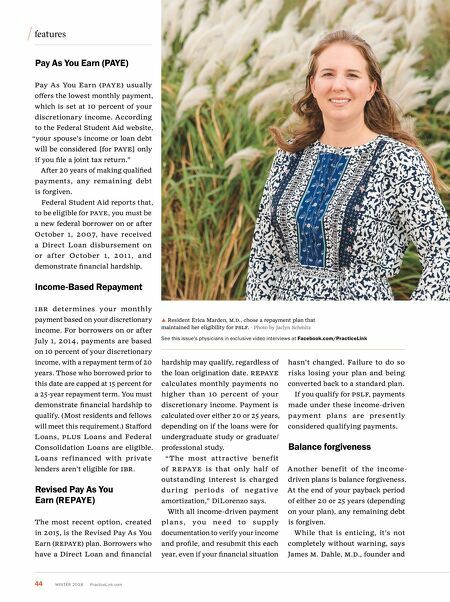 The Revised Pay a s You Earn (REP a YE) program also offers a significant interest benefit that often offers a lower effective federal loan rate during residency and fellowship. Your credit score comes into play. When you apply to refinance your loans, that private lender may make a "hard" inquiry on your credit, which can impact your credit score negatively. a nyone considering refinancing should ensure that it is suitable to do so, and go through underwriting with the best possible profile for success. Too many graduates today apply and receive declinations or undesirable rates, take an inquiry to their credit score, and are ultimately unable or unwilling to refinance. Save yourself this time and effort by first ensuring that refinancing is suitable, and that your underwriting profile will deliver the most competitive results! Jason DiLorenzo is president and founder of Doctors Without Quarters (dwoq.com). Learn more about their free refinancing suitability service at dwoq.com/refinance-analysis.html.